Induction cooking is becoming more popular in the United States. Some people buy a portable induction cooker to try out before purchasing a built-in unit or a freestanding induction stove. Others use it as an extra cooktop or a replacement for their gas or electric stove. Homeowners who provide basement suites to tenants are now offering single and double induction hobs to their renters. Regardless of the reason you are thinking about buying an induction hob, reputable manufacturers are continuously improving the quality of these units. We present a few of the best single burner induction cooktops. Induction cooking is becoming more popular in the United States as its advantages are becoming more well-known. As consumers learn about this cooking method and research available products, they are able to envision how this fits into their culinary style and personal lifestyle. The number of portable induction cooktops from which to choose has increased in the last few years since as more companies enter the market. Induction compatible cookware must be used with all induction cookers. Most, if not all induction pots and pans can also be used on conventional stovetops such as electric and gas. The base of the pot or pan you select should be flat and made of carbon steel, cast iron, enameled cast iron, iron/steel, or magnetized stainless steel. To check your cookware, place a magnet on the base of the cooking vessel and if it strongly sticks, it will work. Max Burton is a well-established brand of Aervoe Industries Inc. whose headquarters are located in Gardnerville, NV. Their products are designed and developed in-house. Aervoe is known for producing reliable products and using high-quality components and cooling fan motors in their manufacturing process. The subject of this review is the new Max Burton Induction Cooktop - the Max Burton #6450 Digital LCD 1800 Watt Induction Cooktop . The 6450 model is a versatile, user-friendly, portable, and easy to clean. It is an upgraded version of the Max Burton 6400 Digital Choice Induction Cooktop. Although the Max Burton 6450 has similar specifications to those of the 6400 model, there are a few notable differences. First, the shape of the 6450 model is more visually pleasing and has rounded edges. Second, the cooktop surface goes all the way to the edge of the cooktop. Third, the computer hardware and software has been upgraded. Fourth, the unit design has been modified to improve temperature control. The Max Burton #6450 Digital LCD 1800 Watt Induction Cooktop Counter Top Burner has an angled control panel (as opposed to a tablet style unit) which lessens the chances the touchpad settings are accidentally changed or spilled food or liquid migrates to the interface. 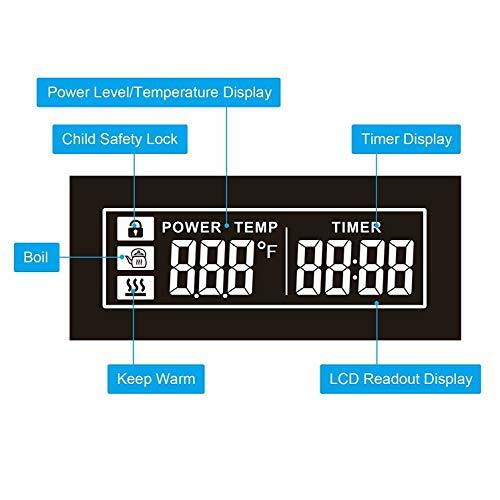 The LCD is a single pane of glass that displays error codes and alternates showing the heat/temperature setting or the time remaining if the timer function is being used. After plugging the unit in the outlet, place the cooking vessel (with the ingredients) on the ceramic surface (in the center of the cookware guides), turn the unit ON, press the “F” icon to select the heat or temp mode, change levels with the up or down arrow, and set the timer (optional). As with all induction cooktops, the right kind of pots and pans must be used. The Max Burton 6450 induction cooker is worthy of serious consideration if you are in the market for a single burner induction cooktop. Two of the most useful features are the one touch boil and simmer functions. Stocks and sauces can be cooked at 100ºF by touching the simmer touchpad. The control panel has an LCD touch screen which is easy to operate. Touch controls are so much better than the push buttons as they are quicker and easier to use. This 1800W induction cooker is equipped with a settings lock and a built-in safety feature that automatically shuts the unit off in the case of overheating, short circuit, and high voltage levels. The unit will not function unless there is a suitable cooking vessel on the cooktop and will cease operating after a period of three hours of non-stop use. A 12” cast iron skillet can be used to prepare your meal since the diameter of the outer ring is 10 inches. The modern and sleek shape along with the black ceramic cooktop make it an elegant addition to any culinary collection. Its portability allows for use as an extra burner or food warmer at a potluck, small dinner party, family dinner or buffet. Max Burton has superior customer service. They offer full U.S. based customer support for technical and warranty issues. Consumers can speak directly with someone who has technical and design knowledge about Max Burton products. This reviewer has contacted technical support on four occasions to ask questions about the Max Burton 6400 and 6450 units. Each time, a knowledgeable expert answered my queries in great detail. This is in stark contrast to companies who do not have telephone customer support and do not respond to emails or to businesses whose chat, email or telephone customer service representatives only have access to the product manual. The Max Burton 6450 model is being sold exclusively on Amazon and only by Max Burton Enterprises (no third party retailers). It is manufactured in China, as are most induction cooktops. Additionally, many parent companies of induction cooktop brands are headquartered outside the United States with no U.S. based customer support, leaving the third party seller as the only point of contact for questions or issues with the unit. 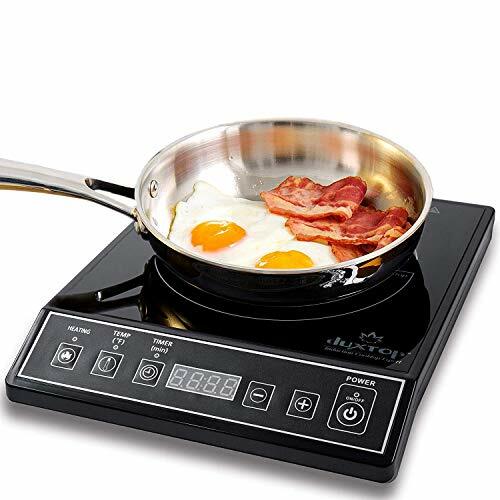 The next portable induction cooktop on our list is the True Induction TI-1B Single Burner Induction Cooktop. This is a 1800 Watt (120V/60Hz) cooktop with the basic functions and a minimalist design. It offers versatility generally not found with single cooktops in that it can be used either as a portable unit or inset into a countertop. The cooking surface of this single burner induction cooktop is ceramic glass. A coil diameter of 7.5 inches allows for the use of induction ready cookware with a base diameter from 4.5 to 10 inches. The touch sensor button functions are: temperature, heat (wattage), timer, and ON/OFF and + and - buttons used to adjust settings. The physical dimensions of the True Induction single induction cooktop are: 15 x 12 x 2.5 inches (L x W x H). The cord has a two prong polarized plug. There are 10 power levels which can accessed by touching the HEAT button. The default power level is 5. If the unit is plugged into a standard 110V outlet 1600 Watts of cooking power is produced. However, if a 120V outlet is used, 1800 Watts of power can be achieved. The temperature range is 150º – 450ºF with 11 temperature levels adjustable in 30 degree increments. Temperature settings: 150, 180, 210, 240, 270, 300, 330, 360, 390,420 and 450ºF. This True Induction cooktop has a built-in 150 minute timer. To use this function, press either the HEAT or TEMP button and then press the Timer button. Then using the -/+ keys, adjust the time in one minute increments. The time can be changed during the timer operation and the settings will remain as originally programmed. Additionally, the HEAT or TEMP settings can be changed without the timer setting being affected. The display counts down the duration in minutes. Once the time is up, the unit will beep and go into standby mode. If you want to continue cooking, just press the POWER and HEAT buttons to restart the unit. 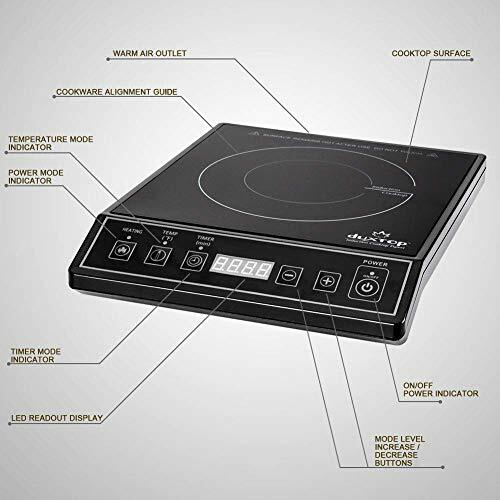 This True Induction Cooktop has a 2-Year Warranty (excluding issues arising from customer misuse or mishandling) provided you mail the warranty registration card to them. The warranty information on their website says to return it within 10 days of purchase. If the card is not completed and returned, then the one year warranty applies. The True Induction telephone customer service is U.S. based which is a real plus for me. I contacted them with a list of technical questions and received a friendly and thorough response. Bringing in the next model on the list, is the Secura 9100MC 1800W Portable Induction Cooktop. This cooker comes with all of the standard features of induction cooktops including an impressive 15 power levels and simmering capability. The Secura 9100MC induction cooktop is a robust unit and overall a very good value. The 15 power levels range from 200 to 1800 watts. The first 12 power settings are in 100 Watt increments and the last three settings are 1500W, 1600W and 1800W. The default power level is 5. The electrical requirements for this 1800 Watt induction cooktop are 120V/60MHz/15A. The cord has a two prong plug and according to Secura Customer Care, is 5 ft long (they apologized for the typo in the user manual). There are 15 temperature settings which range from 140°F to 460°F. The first 11 settings are in 20 degree increments and the last 4 readings are 370, 400, 430 and 460°F. The default temperature setting is 320°F. The 9100MC The power and temperature levels (from 1 to 15) are adjusted using the plus and minus buttons on the control panel. A reference table is provided in the 9100MC user manual that equates the power level with wattage and the temperature level with temperature in both degrees Fahrenheit and Centigrade. This Secura model has a built-in countdown digital timer with one minute increments up to 170 minutes. The Secura 9100MC 1800W Portable Induction Cooktop is a well-designed, portable and easy to operate unit. It is also lightweight and compact which makes it easy to carry and store. As you can see from the above picture, the front panel is angled. This is preferable to tablet-like designs because it reduces the chances of the pan edges touching the controls. The digital panel includes functions for power, temperature, and timer (adjustable in one-minute increments). In the center is a LED display. The other controls are for increasing or decreasing the power and temperature levels and switching the unit on or off. The physical dimensions of the Secura 9100MC are: 14 x 11.4 x 2.5 inches (L x W x H). The glass cooktop portion measures 10 5/8" x 10 7/8. The diameter of the inner ring is 8 5/8 inches and the outer placement guide is 9 3/8 inches. The minimum diameter of the pot or pan that can be used is 4 inches and the maximum is 8-8.5 inches. This unit weighs 5 pounds 12 oz. The cooktop will switch from the Power mode to the Temperature mode when overheated. The Secura 9100MC is both FCC certified and ETL approved. The biggest selling points of the Secura 9100MC 1800W Portable Induction Cooktop are the 15 power levels and the fact that the food is cooked thoroughly and evenly on this cooker. Another advantage of this Secura cooktop is that the temperature can be controlled so that simmering jams, stocks, soups and sauces is very easy. Secura's most recent induction cooktop offering under the Duxtop brand, is the Duxtop LCD 1800-Watt Portable Induction Cooktop. This upgrade from the 9100MC model offers a better designed unit with touch controls, one touch boil and keep warm functions, a child lock, and an additional 5 temperature and power setting options each. The electrical requirements for this unit are 120V/15A. 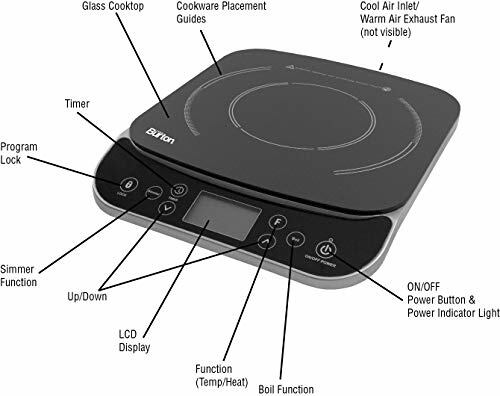 The following is a list of the features of the Duxtop LCD 1800-Watt Portable Induction Cooktop that are not included in the 8100MC and 9100MC models. 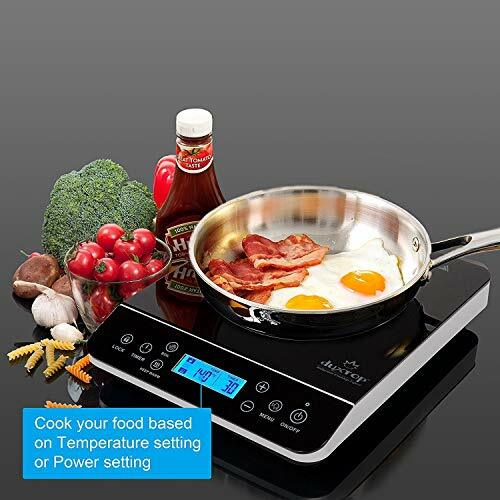 This tabletop induction burner provides the option of cooking in either the power mode or temperature mode. The 20 temperature settings have a range of 100º-460ºF. The settings are in increments of 20º from 100º-360ºF. The remaining settings are 375º, 390º, 405º, 420º, 440º, and 460ºF. The 20 power levels have a range of 100-1800W. From 100-900W the increments are in 80W increments. The remaining power levels, from 900-1800, are in 100W increments. The levels are increased or decreased using the plus and minus buttons on the control panel. The power levels are adjustable in .5 increments from .5 to 10. As in the other Duxtop/Secura offerings, a table equating the power and temperature levels to watts and degrees Centigrade and Fahrenheit can be found in the Duxtop 9600LS user manual. It is important to remember that if the unit is switched off, the surface and the cooking vessel still stay hot for a short period of time. The timer can be set in one minute increments up to 10 hours. However, the unit stops operating after two hours. Secura customer service stated this was a safety feature. The physical dimensions of the Duxtop 9600LS are: 14 x 11.4 x 2.5 inches (L x W x H). The glass cooktop portion measures 11”x 11.” The minimum diameter of the pot or pan that can be used is 5 inches. This unit weighs 5 pounds 12 oz. The cord is 5 feet long. If no cookware or unsuitable cookware is detected the unit will automatically shut off. If the voltage input is too high or too low the unit will shut down after one minute. If the cooking surface temperature exceeds 460ºF, the cooktop shuts off automatically. The Duxtop LCD 1800-Watt Portable Induction Cooktop is well-designed and user-friendly. It has an angled control panel which greatly minimizes the chance of a hot pan on the cooktop touching it. The control panel interface is straightforward and the LCD display is easily read. One of the better improvements over previous models is having touch sensors instead of push buttons as they are easier to use and clean. This model has a delayed shut off that is handy in case the pan needs to be taken off the burner for just a few seconds. Greater heat control and overall flexibility is now available with the 20 temperature and power settings provided. The lower temperature setting provides the option of simmering at a 100ºF instead of 140ºF. The keep warm function sets the temperature at 140ºF for 30 minutes. When the boil feature is selected, the unit will be set to level 10 in the power mode for 10 minutes and then will shut off. The addition of the settings lock is an important safety feature that prevents children and pets from changing the settings while the unit is in use. However, it does not affect the ON/OFF control as the unit can be shut off even if it is locked. The ON/OFF button has to be held for 3 seconds. Some people might find this annoying; others perceive it as good safety feature. Secura customer service for inquiries regarding their products is handled via email. Telephone assistance is only available for checking the status of an order placed directly with Secura. This reviewer wrote Secura an email at 4:11 pm Monday, June 18 and received answers to both of my questions at 11:04 am the next day. Their response to my query regarding the diameter of the coil was that it is about 6.5 inches. They also clarified that the cord length for the 9100MC is 5 ft.
Our next review is of the Cuisinart ICT-30 Induction Cooktop. This single burner induction cooktop made our list because it is a no-frills unit and one that can be used by someone who is not very tech savvy. It only has two functions: TIMER and a HEAT mode with 8 pre-set levels. 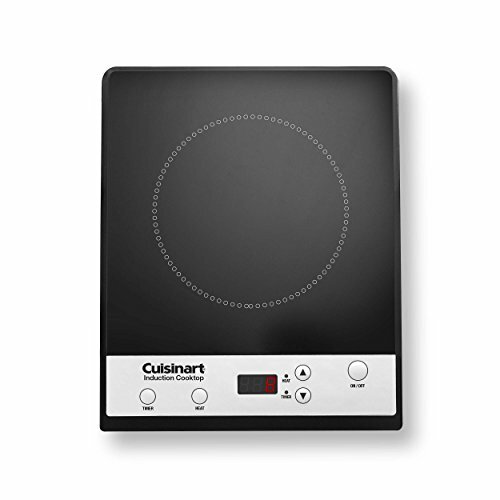 This Cuisinart ICT-30 Induction Cooktop has a tablet-like design. While some consumers prefer this type because it is easier to clean, others believe it is better to have an angled control panel. Either way, you’ll want to take care not to allow the cooking vessel to touch the display panel when placing the cooking vessel on the unit or when removing it. The LED display only shows HEAT levels, not temperature readings. Up and down arrow - increase or decrease the timer setting and the temperature levels. Dimensions: (L x W x H) 14.10" x 11.50" x 2.00"
Heat Mode - 8 heat settings range from levels 1 to 8 with a default level of 4. The user manual states the power range is 300-1600W. However, there is no power mode, only heat. Cookware that is not induction ready is placed on the cooktop. The unit is turned on and no cookware is placed on the cooking surface. If cookware is removed from the cooktop while in the operation mode. The cooker is very easy to operate. After plugging the unit into an electrical outlet, place your induction ready pot or pan (with ingredients) on the cooktop, press ON/OFF button, press the HEAT button and use the up and down arrows to select the desired setting. It really is that simple. Although there is a timer function, it does not have to be used. As with all induction cooktops the proper cookware must be used. The smallest diameter of a pot or pan that can be used is 4.7 inches. NOTE: This review is not as detailed as the others as the only information available online is what is written in the user manual and on Cuisinart.com. The Cuisinart telephone customer service representatives are very nice; however, they can only answer a question if the information is in the user manual. There is no telephone technical support available. After carefully going through features, testing, reviews, and performance, of these five induction cooktops I believe the best portable induction cooktop is the Max Burton 6450. It has a lot of advantages over the cheaper models and is worth the extra investment. This is a well-designed and user-friendly unit with important safety features and flexible heat settings while still reasonably priced. Induction cooktops are incredibly impressive, especially when you want thorough and even cooking in a short period of time. Induction cookers stay cool to the touch, come with a variety of features and cooking solutions, and work with different cookware. Use this guide to help you narrow down the type of portable induction cooktop you need. Understanding the type of cooking that you’re doing and the space you have available is going to help you determine the size of the induction cooktop that you need. The majority of all portable induction cooktops are used by individuals who have small cooking spaces, require an additional element, or who want something to take camping or on outdoor adventures. While most portable cooktops only have single elements, some models have dual burners. The cooking zone on an induction cooktop is considered the area that you place your cookware that heats up with a magnetic current when the induction process starts. Inset induction cooktops typically have four cooking zones, where portable induction cooktops range between a cooking zone of one or two. Once you know what you are using your cooktop for, you can determine how many cooking zones you need. The touch controls on your induction cooktop are essential. Make sure they are clear, easy to read, and positioned in a place that isn’t too close to the pan. Additionally, you should be able to control temperatures quickly, easily turn the cooktop off, and manage safety settings from the touch controls on the appliance. Induction technology works in a few different ways, and one is energy efficiency. The technology built within induction cooktops allows the cooktop zone to recognize the size of the pan once it is placed on the element. It’s that technology that causes the magnetic current to provide an accurate heating source to the size of the cookware being used and nothing larger. Timers on induction cooktops are very important, especially as you get accustomed to the new appliance. When looking at which induction cooktop to purchase, the one bought should come with a timer that has one- to five-minute increments included. If you are a seasoned induction cooktop user, five minute increments are typically fine. However, first-time users should consider the cooktops with one-minute intervals. 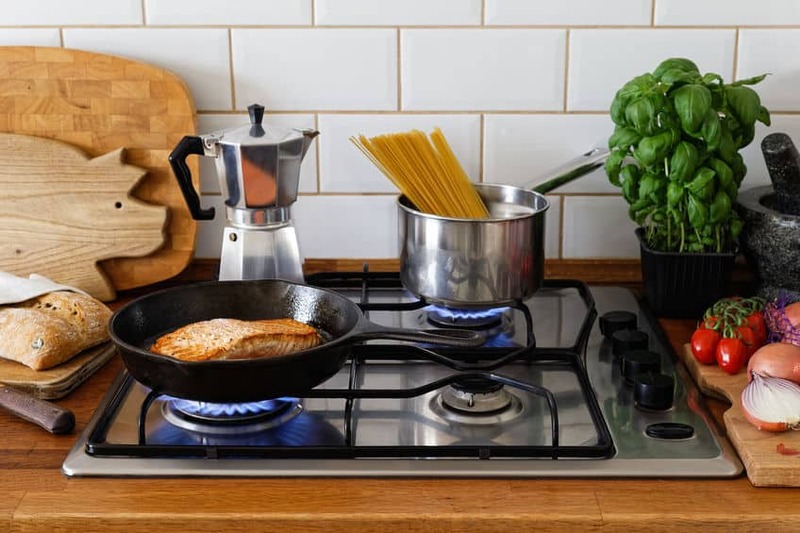 Even with a cooktop that doesn’t have an open flame and isn’t hot to the touch, safety is still a vital element and is always something that should be considered when purchasing any type of cooktop. There are plenty of induction cooktop models that include an automatic shutoff feature for your safety. With most models, the unit shuts down once the automatic pan-detection sensors no longer recognize cookware on the cooktop. There are also models that have safety options that shut the appliance off after 30 to 60 minutes without a pan on the cooking zone. The temperature sensor of portable induction cookers is located underneath the glass cooktop. 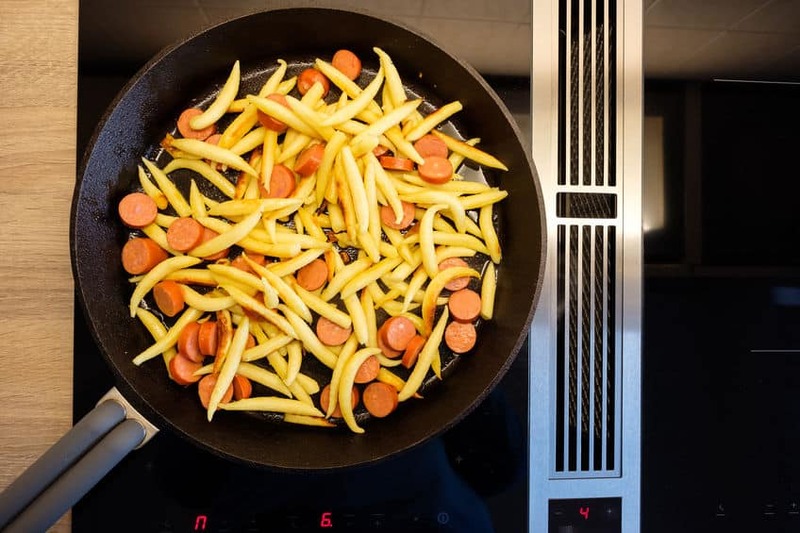 When the temperature is initially set, the sensor does not immediately measure the temperature of the food in the cooking vessel since it takes time for the cooktop to heat up. Similarly, when after the unit has been shut off, it takes a period of time for the temperature of the pot or pan to reach the temperature sensor. If the food is left on the cooktop it will continue cooking for a short time. 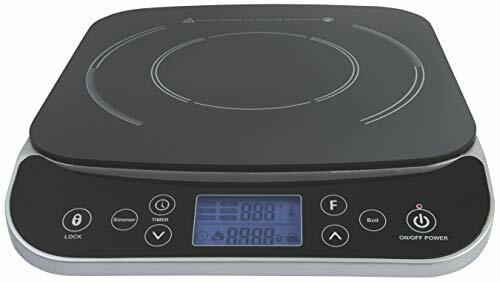 The maximum wattage output of portable induction cooktops appears to be dependent upon the pot/pan diameter, the materials used to manufacture the pan and the amount of liquid in the cooking vessel. For example, if the diameter of the pot is 4.5 to 6 inches, then the maximum power reached is around 1000-1200 watts. However, a higher wattage will result if a pan with a diameter of 6 inches is used. How to Clean an Induction Cooktop? Depending on the induction cooktop that you have, cleaning is going to be quite simple. 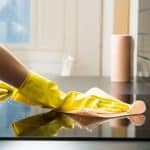 Your owner’s manual tells you everything you need to know about maintenance, but for regular cleaning, simply use a small amount of cooktop cleaner. You can use a sponge or paper towel on the cold surface to clean it thoroughly. If the induction cooktop needs heavy duty cleaning, you can replace regular cooktop cleaner with ceramic cooktop cleaner and use white vinegar for water spots. 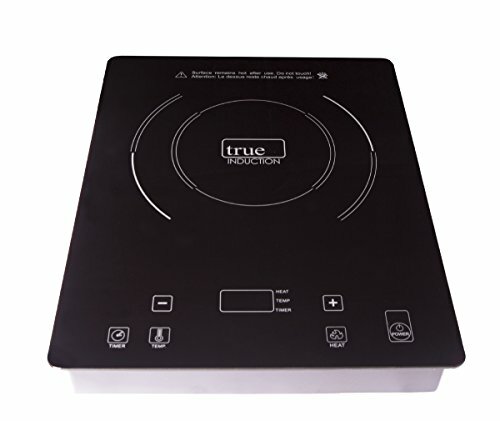 How to Use an Induction Cooktop? How you’re going to use the cooktop is going to be dependent on the model that you’re using, and you should always consult with your owner’s manual to ensure you’re using it properly. Once you’ve made certain that you are using the correct cookware for your induction cooktop, it’s quite simple and a matter of setting your desired temperature and making sure that the cookware is in alignment with the magnetic element. The temperature sensors underneath the ceramic or glass/ceramic plate on induction cooktops do not immediately measure the temperature of the food in the pot. This is because it takes a period of time for the ceramic to heat up. When using my induction cooktop I use the power mode first, (usually at a low to medium level) and stir the food for a little while, giving the sensor time to catch up to the temperature of the contents of the cooking vessel. Then, if necessary, I switch to the temperature mode and select a setting. For best results when using induction cookers, center the cooking vessel on the cooktop surface. When taking your pot off of the burner, lift it off rather than sliding and then lifting. This will ensure the bottom of the cookware doesn’t touch the controls. What Pans Work with Induction Cooktops? Induction cooking is very different from standard cooking, so specific cookware is required. The easiest way to tell if your cookware is induction ready is to test the bottom of your pots and pans with a magnet. Alternatively, cast iron, many types of stainless steel, and enamel cast iron cookware are induction ready. Before purchasing any kind of cookware, look for an induction ready symbol or ask a sales associate to assist you further. You could also go a step further and have them remove a pot from the box, so you can test to make sure that it’s induction capable. 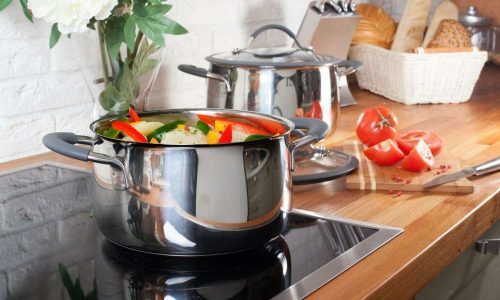 The temperature of the food in the pot is dependent upon variables such as the materials used in the manufacturing of the cooking vessel, the diameter of the bottom of the cookware, and the amount of liquid in the pot. Therefore, it will probably be necessary to experiment with the temperature levels to determine the correct one for simmering a particular recipe. What do ETL and FCC Certifications Mean? In products reviews, sometimes the acronyms ETL and FCC are mentioned. The ETL Mark is proof of product compliance to North American safety standards. The FCC Declaration of Conformity certification mark on electronic products manufactured or sold in the United States certifies that the electromagnetic interference from the device is under limits approved by the Federal Communications Commission. Can You Use Cast Iron on Induction Cooktops? Yes. Cast iron cookware can get used on induction cooktops and are recommended. It is essential to keep in mind that your cast iron skillet could scratch the surface of your induction cooktop, and the heightened induction heat could warp your cast iron cookware over a period of time. Do Induction Cooktops Need Venting? With many induction cooktops, there is a whirling sound when cooking, and that noise comes from the cooling and ventilation fan. While induction cooktops work differently, it doesn’t eliminate the need for proper ventilation as there is still heat involved. The air movement helps to remove steam that naturally comes from cooking, and there are typically grease traps built directly into ventilation hoods.